Metal bi-fold doors — now there's a product of the '70s that few of us are sure to miss. I remember having them in my childhood bedroom. The spring-loaded pivots were always coming loose from their plastic gliders, and the grating sound of metal scraping along the rail made for an unpleasant start to each day. Maybe everyone's morning routine wasn't quite as busted as mine, but when I saw my home had metal bi-fold doors in the master bedroom, I knew right away they had to go. 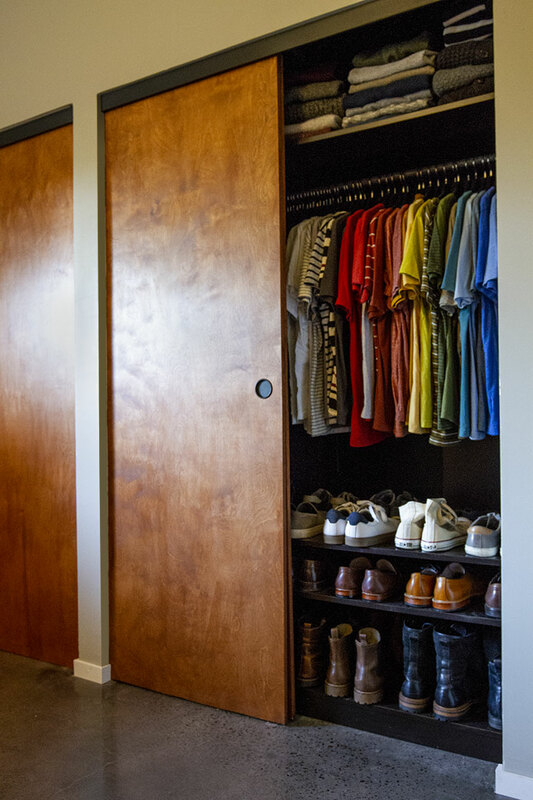 Unlike the other bedrooms rooms in the house, the master does not have a walk-in closet. I recall a couple at the open house commenting, "We'd never fit in here. ", as they went through the master. Now that I think about it, that's a pretty funny statement. Hmm. At any rate, I'm glad they wouldn't fit whether figuratively or literally as I saw the potential in this closet, and knew it could be reworked to have more space with better planning. The interior of the closet contained a series of plastic coated wire racks. These provided storage, but not the best looking or most functional of options. 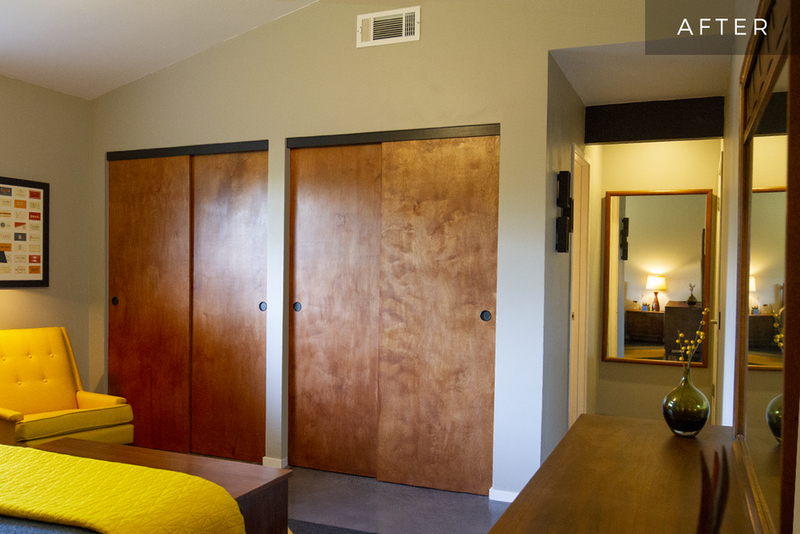 I wanted a fresh start with something that looked more finished and tailored, so I gutted the closets completely. The height of closet doorway has a clearance of 7 feet high, so I was initially looking for organizers in that size. However, the interior of the closet extends to 8 feet, which is quite a lot of real estate for a side-by-side closet -- 20 cubic ft. to be exact. 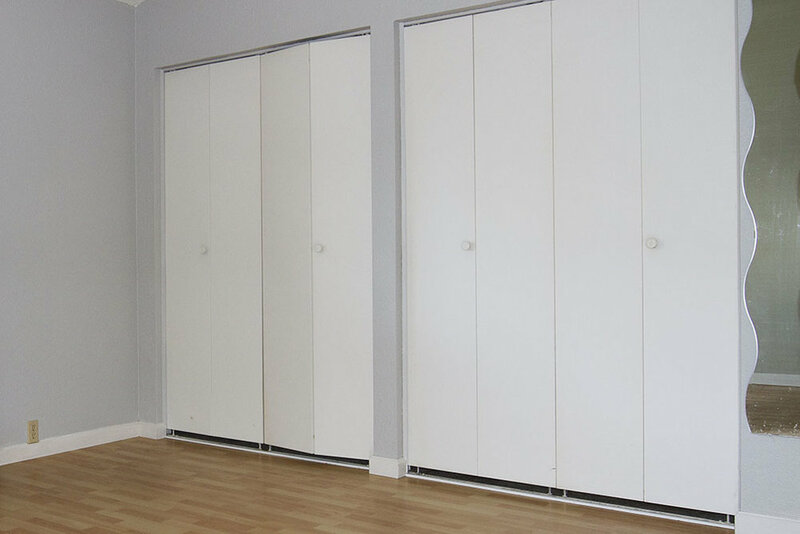 When it comes to closet organization systems, Ikea has excellent, affordable solutions with a minimalist look. I opted for their 93" PAX system in black-brown. Knowing that the units would not slide into the closet opening once I had them fully assembled, I had to build them inside the closet, which was awkward, maybe a little unsafe, and certainly contrary to those wonderful pictorial instructions. Nonetheless, the effort was worthwhile as I was able to create ample overhead storage that extends far into the closet ceiling -- perfect for bulky items such as extra bedding and luggage. Closet accessories from the KOMPLIMENT line were used for added functionality in each compartment, which include clothes bars, shelving, and slide out racks. Solid wood hangers provide a uniform, tailored look that I'm sure Joan Crawford would approve of. The modular features of this unit also give the feeling of a custom built-in. As storage needs may change down the road, adding/removing shelves, bars, and other components will be a breeze. I purchased (4) 3/4" 4x8 sheets of birch veneer plywood and cut them to 28"x80", leaving just a minimal gap at the bottom for a clean, finished look. At first, I had intended to simply stain the sides of the plywood, but the exposed layers of wood were difficult to stain, leaving little gaps and pits of unfinished wood visible along the sides. I thought I could live with it, so I hung the doors as they were. As a few days passed, I realized this wasn't up to par and needed to be corrected. So, to cover the unfinished edges, I used a 3/4" iron-on birch veneer band. Ironing on the veneer would have been a lot easier to apply while the doors were laying flat, but I'm chalking this up to a lesson learned. Once glued in place, the veneer was trimmed, sanded, stained and oiled to match the door surface. This is the same stain used on the living room partition wall and original kitchen cabinets. As a result, I'm much happier with the finished edges, and I think the closet feels that way, too. I used a 2" hole saw to drill for hardware on each panel. These were filled with black/bronze pulls, which contrast nicely against the warm woodgrain. I'm a huge fan of how black and wood were used in mid-century design, and found that the scheme works really well in this application. 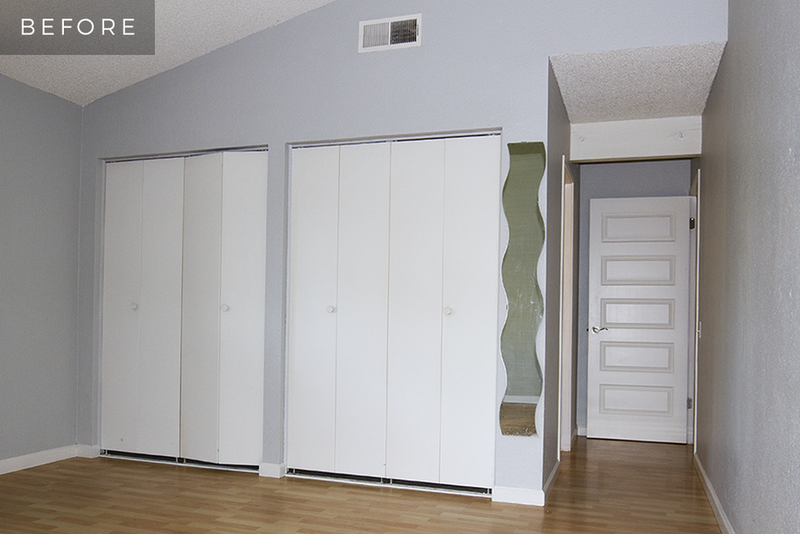 Scrap baseboards were applied across the top of each closet opening to hide the rail hardware. 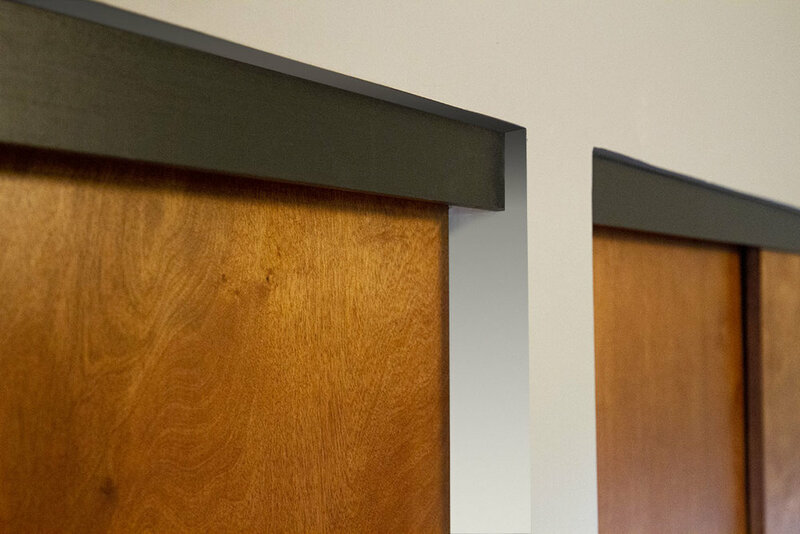 The boards were painted black to mimic the architectural beam in the nearby entryway. I adhered double-stick foam tape to the back to secure them to the metal rails. This provides a tailored valance to each door that adds both function and style. 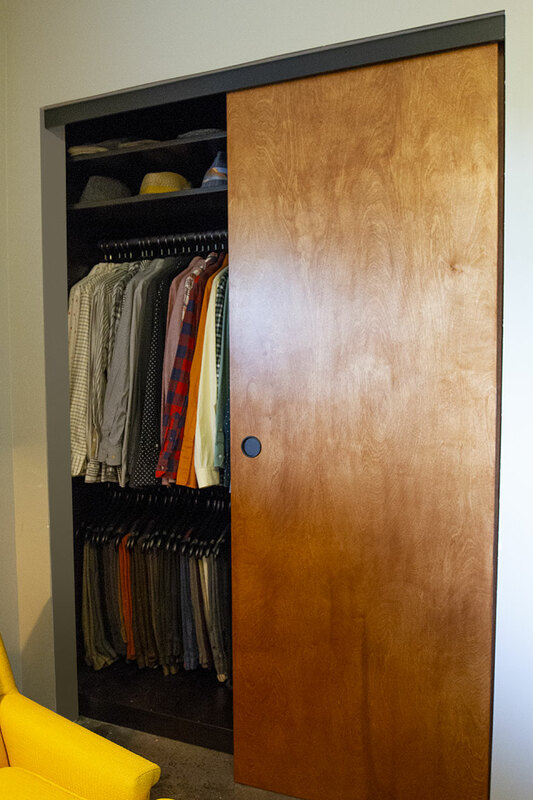 The end result is a custom look closet with an ample, modular storage solution that adds texture, warmth and interest to the space. There's space for lots of shoes, ties, belts, an ever-growing hat collection -- even the laundry hamper! Already, I'm feeling more organized, and selecting an outfit each day feels like shopping at a fine boutique clothing store that has all the comforts of home.